The primary key to a disciplined and productive pool game is a good mechanical and mental pre-shot routine. Standing behind the cue ball and "chalking up" every time in this position will assure an "interlude" or "time out" to image exactly what you want to do in a fluent and rhythmic manner. Placing the body in a proper relation to the shot and aligning the cue stick in a proper relation to the cue ball travel line are essential for consistent results. "Forming that stance" correctly will create balance and stability in preparation for "addressing" the cue ball and taking the shot. The front hand should support the cue stick with an easy to understand formation and comfort in shooting. The "open, tower, or V Bridge" does just that. All beginning players should consider this bridge to start with. Over time they will find advanced uses for it in specific game situations. As a player becomes more adept at english control and hand adjustments for holding the cue, the "closed bridge" should be considered. This support tool will allow for flexibility to draw better and increase speed with more accuracy. Most players at higher skill levels use this bridge. Most problems with what goes on in front of the body are the direct result of what goes on behind the body and are normally centered on "the grip". Holding the cue too tightly with the rear "gripping" hand will cause the cue to spring upward on cue ball contact. "Squeeze the Charmin"
The first part of "aiming" is to establish the "object ball travel line". This line is very simple to calculate and is a straight line from the center of the object ball to the center of the pocket opening determined for each shot. Shooting 15 balls without a cue ball will ingrain aiming confidence. Aiming (Cue Ball Travel Line) - Learning to shoot the cue ball in a straight line combines good pre-shot imagery with the knowledge of where the cue ball must end up in relation to the object ball. "Ghost ball" training, along with "straight" movements of the cue stick will produce simple, yet profound results of good aiming. Basic Cue Ball Effects - The use of "english" or "spin" on the vertical or horizontal axis of the cue ball should be dealt with very carefully. Hitting the cue ball in the center or with stop (slightly below center) are primary beginning points of "cue ball control". Follow is next in order to learn how to roll into position. "Drawing the cue ball" is the first of several advanced techniques for position play. Success in this area requires a very loose "grip" and a firm "bridge". The cue must accelerate through the cue ball upon impact and the cue must maintain a level plane movement. Drawing is an "art!" Lateral (Exotic Spin) Applications! - Sometimes a player must maneuver the cue ball in tight quarters or find it necessary to move the cue ball from one end of the table to the other, but finds it difficult to accomplish this with basic spins or even standard side spins. the use of "exotic spins" may be just what the "doctor" ordered!! Stroke Defined With Speed Practice - The key element for getting in touch with the "throwing motion" of a good stroke is to use a "slow" backswing on the final stroke cycle and combine it with an obvious hesitation before releasing the cue forward to complete the stroke. A great way to practice this technique is to shoot 15 balls at 3 different speeds in a rotating shot pattern. Focused repetition used in the rhythm / fluency for each shot will provide tremendous benefit to your actual performance and your "looking like a pro". Follow-Thru With Controlled Practice - Almost all top players have a defined and obvious follow -- thru after striking the cue ball. The foot or head spot on the table is a perfect training tool for assuring the "victory" of a good follow -- thru and the accuracy of getting the cue ball to go exactly where you want it to go. A player that has a great follow -- thru appears to have the control and confidence so needed to enter the winner's circle. Any player that performs at a maximum level demonstrates the "rhythm and fluency" of a consistent pre-shot routine and stroking pattern. These repetitious factors of game success should include a programmed mental / physical memory of body / cue movements. A simple ball shooting exercise can be used to develop this technique and have fun in the process. The awesome nature of the "stop shot" can be used for pinpoint cue ball control and as a valuable tool for accurate carom shots. Stopping the cue ball "on a dime", so to speak, for any straight in shot requires hitting the right spot on the cue ball with the correct speed for a respective distance between the cue ball and the object ball. Rule of thumb -- for longer stop shots, one must hit the cue ball lower and / or increase the speed applicable to the shot. The knowledge necessary for playing position to a general area of the table or what some refer to "zone position" can be acquired very easily by doing a simple cue ball / object ball position exercise. This learning tool will help a player travel the length of the table to a "zone of success" and to better understand the idea of hitting the cue ball with the proper vertical tip position necessary for getting on the correct side of the table using a natural carom angle. When getting position becomes more difficult because of blocking balls, and the cue ball must end up in a specific place for the next shot, a "template of practice" can be used to learn the effect of the spin applied. High English that is practiced with a specific purpose in mind will result in shot success...considering the critical path the cue ball must take. Using the same "template of practice" as in Segment #18 a player can quickly see the results and subsequent position benefits of applying different spins to the cue ball. When it is necessary to make the cue ball travel around the table with little effort, full side (lateral) spin will do the trick. A table that appears to play slow can be "made fast" by this side spin test. Developing a straight stroke means that the muscle memory of the stroking movement must be trained to go straight. The diamonds on the rail tops provide a natural method of doing this. In addition, a unique "barrier" technique for conditioning the proper muscle memory of a topflight stroke can help tremendously. A few minutes a day with either of these stroke enhancers will assure a higher degree of shot success and game victory! One of the most beautiful and exciting joys in the game is when you make the 8-ball on the break. The proper striking point of the cue ball on the second ball in the rack...combined with the proper cue ball position in relation to the side cushion will help you to make the illusive 8-ball on the break in your quest for game success -- Rack Up A Victory!! 9-Ball players have a better chance of running out if they can spread the balls on the break and make a ball in the process. Learning this suggested and high percentage angle of entry to the one ball assures the best opportunity for game victory and enjoying this fast paced game even more -- a simple concept with amazing results!! There are thousands of cues available for purchase in the marketplace today. Learning what to look for will help you make an informed and investor wise decision in the cue buying process. Knowing the parts of a cue that affect your game performance and overall shooting enjoyment can be helpful tips in your search for not only a long lasting cue, but also one that feels like an "extension of your arm". Playing position should be a dedicated point of focus for any player during successful pre-shot routine imagery. To accomplish this with consistency of stroke the "identity" of specific shots that are most common to the game can be established. When these "identified" shots come up, a special mental "comfort" provides confidence of shot execution. Playing "back to" and "across the center" of the table on the popular "cut to the corner" identity shot in this segment will produce great results!! The "cut to the corner" identity shot in this segment is very common to professional play and should be embraced in all amateur practice for position play. Listening to the "click" of the cue ball as it hits the object ball will implant an "audio" link to executing this shot well. Watching the cue ball travel "back to" and "across the center" of the table with this beauty will enhance your play comfort tremendously. Shooting with inside english and increased speed is often difficult. Focused practice applied to this "identity" shot is one of the most important measurements of game success when drawing a ball is not an option to get around the table...using the "center of the table" as a reference point for the cue ball travel. Maintain a firm bridge for this position enhancer!! The backwards cut to the corner with the cue ball traveling to the opposite side cushion, across the table center, and beyond, as needed for position, will surely take your game to the next level and beyond. Take a little extra time for shot making accuracy and precision draw with side spin action application. A crisp follow thru with a solid closed bridge will give you the results you are looking for!! Some players cut object balls better to their right and some players cut object balls better to their left. The exercise in this segment will help you determine which is better for you. In addition, watching your opponent play specific cut shots during the game will reveal which cut side they play better toward. Remembering this will give you the edge in playing defense. You should always favor leaving your opponent a cut opposite their better side!! No one is immune from missing an easy 8-ball to win the game. During a game a player makes a ball and plays position a maximum 7 out of 8 shots or 87.5% of the time. On the final shot the brain registers making the ball, but not playing position. The brain short circuits, so to speak, 12.5% of the time, and does not understand why it is not playing position on the final shot. This right brain thing can be fixed by creating a mental ball for imaginary position to an easy place on the table. 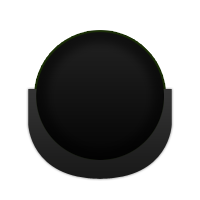 Shooting the 8-ball now becomes part of the normal shooting journey with a subsequent imaginary shot providing victory!